In some settings, using a territorial has become a common practice. Often it involves a brief statement at the beginning of a gathering or event to name the Indigenous territory that the gathering is taking place upon. It often involves the names of the First Peoples of the particular area and may also involve acknowledgement of treaties that may have covered that area, or an acknowledgment of the fact that no such treaties exist in the area. It may also involve giving thanks for the land and acknowledging the ongoing oppression and struggles for justice that are facing Indigenous peoples and communities. In a church setting, a territorial acknowledgment can be a meaningful and important practice. It can take place in a variety of ways and can be visual and/or spoken and used in different contexts. In many cases, it might include a spoken statement at the beginning of each worship service. An acknowledgment of territory could be printed in the church bulletin, written on the church sign outdoors or be connected to a piece of visual art or a map somewhere in or on the church building. If your church has a garden our outdoor area, it could be present there. There could be a special plaque with this information. It might be present on the church’s website. It might be spoken not only during worship but also during church meetings and other gatherings. Consider how and where your church history is presented and how to integrate a territorial acknowledgment into that story, as well as any work throughout your church’s history towards reconciliation and right relations. 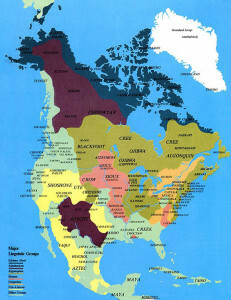 A territorial acknowledgment is important as part of our churches living into right relations with Indigenous peoples. For churches that ran residential schools, it is part of living out our apologies for that reality and its ongoing legacy. It is a statement of respect and a statement that provokes further thought and reflection. It is a way to counteract the ideologies operating in the Doctrine of Discovery by naming that the land was not empty when Europeans first arrived on Turtle Island. It can be an opportunity to acknowledge the spirituality of Indigenous peoples that was not respected by churches and was used to justify colonialism, including the residential schools. A spoken territorial acknowledgment in worship might be a statement that is used consistently, or it might be something that changes depending on the context and the liturgical season and other factors. It can be something that is responsive or something that is said by one person. It can be done in the context of a prayer, particularly a gathering prayer as people arrive and ground themselves in the worship space. If you use a projector, there might be a visual image that accompanies spoken text, or the territorial acknowledgment could be a video. Welcome to this service of worship. We begin by acknowledging the traditional territory upon which we gather this morning. For many thousands of years, the (name the nation or nations) have sought to walk gently on this land. They offered assistance to the first European travellers to this territory and shared their knowledge for survival in what was at times a harsh climate. We seek a new relationship with the Original Peoples of this land, one based in honour and deep respect.